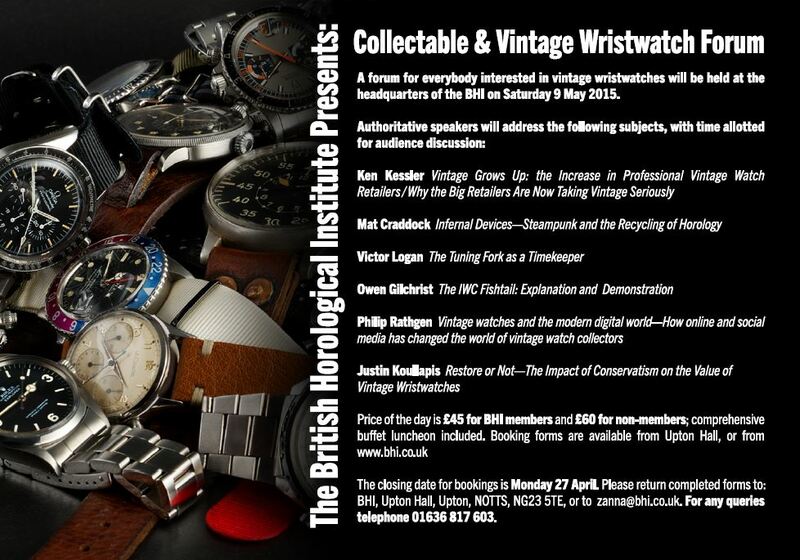 The British Horological Institute are holding a Collectable and Vintage Wristwatch Forum at which there will be a number of esteemed speakers. One of them is my friend the #watchnerd, who will be talking about the influence of steampunk on modern watchmaking. Amongst the people he will be mentioning are Vianney Halter, Max Busser & Friends, Thomas Prescher, and the always intriguing Haruo Suekichi, whose watches were one of my earliest online exposures to steampunk watches. In addition to talking about steampunk #thewatchnerd will also be raising the issues surrounding the destruction of watch movements when cases are melted down for gold. On this topic he is still researching, so if you know of anyone who might be able to assist, or if you wish to read more about his talk, please go to this link. To book your place at the forum, click here. It will be held on the 9th of May 2015 at Upton Hall, Nottinghamshire.